Virgin America appears to be the winner of the 2 gates at Love Field according to numerous reports in Dallas media. There is no official city announcement to date but reporters are citing two unnamed sources in the City Manager’s office confirming this outcome. Dallas media is rarely wrong with such sources. It’s an acceptable outcome for Dallas. It won’t really increase competition in this marketplace very much except on a few long haul routes out of Dallas but it will be quite interesting to see the effect Virgin America has on those routes as I think it will provide justification for pursuing even more competition in the marketplace. When I’m asked who I would like to see get those gates, that’s a tough question. Frankly, after much thought I’ve begun to think that Dallas might have actually been best served with common use and better served by Delta Airlines or American Airlines flying out of those gates. Let me make an announcement: There is room in the DFW marketplace for a shorthaul provider using the Q400 or ATR72 to serve markets in the Texas regional area out of DFW. In my opinion, you could very well make a killing with this airline. Particularly if you base out of DFW. From DFW, you could serve: Houston (2 airports), Austin, San Antonio, Corpus Christi, Brownsville-Harlingen, McAllen, Abilene, Laredo, Midland-Odessa, El Paso, Lubbock, Amarillo, Little Rock, Fayetteville, Tulsa, Oklahoma City, Shreveport, Memphis, and New Orleans. You can string together low frequency cities for a better load factor and you can do high frequency turns at larger city airports. And you could probably do a deal with some of the other airlines serving DFW to interconnect. Your seat costs would be superior, your weather would be more than acceptable and your price would make your competition whimper. In the meantime, let’s be glad the The Great Gate Fight is over (we hope) and see what comes next. City of Dallas consultants, L.E.K. Consultants, has come out saying that it’s Southwest Airlines who should get the 2 American Airlines gates at Love Field Airport. Their rationale boils down to the idea that Southwest will drive the most passenger traffic for the city and that is therefore the most economically sound justification. Their criticism of the Virgin America lease is that it removes some flights from DFW airport and transfers them to Love Field. You can’t look at this picture statically. Driving passenger traffic isn’t necessarily what’s best for consumers. It may well seem good for the city but it won’t necessarily be good for consumers. As foolish as I think some of the Justice Departments moves have been in the AA bankruptcy, they aren’t incorrect in the idea that these things should drive competition and benefit consumers. The consultants seem to be squarely aimed at the idea that what’s good for a business will be good for consumers. I would disagree with that. What Dallas has needed most for a long time is competition on a variety of long haul domestic routes in and out of Dallas to a variety of destinations. Southwest will provide some of that sorely needed competition on October 13th. And they will provide it regardless of whether or not they get those gates. Virgin America will provide some of that competition too although I would argue that we could use a more creative and extensive LCC than Virgin America. What is most needed at Love Field is . . . wait for it. . . . more gates. 20 gates just isn’t enough. Absent more gates, Southwest should be relieved of its burden to give up gates to get gates at DFW. The competitve landscape has changed and, unfortunately, that change occurred before the end of the Wright Amendment on October 13th. But 20 gates at Love Field isn’t enough. Chicago Midway serving as an adjunct airport very similar to Love Field has 43 gates. Would I suggest that Love Field should have that many? No. But the airport cannot serve any other airlines very effectively despite being open to do so at this time. 6 to 10 additional gates would make sense at the airport. Barring that, Southwest should not be required to give up gates in order to use gates at DFW airport. In making the deal to lift the Wright Amendment, the parties involved essentially constrained Southwest Airlines from growth in the DFW area. In fact, the deal was designed to penalize Southwest if it wanted to grow by using DFW airport. Isn’t it time to quit taking swipes at Southwest for not moving out of Love Field Airport more than 35 years ago when DFW was opened? Southwest is a huge employer in this area and a huge tax contributor and excellent corporate citizen. Why do we want to exact revenge against the very kind of company we should want in our community? Well, in an unofficial official announcement by Virgin America at Love Field Airport in Dallas, Virgin America says it will get the two gates at Love Field. The airline says it has approval from the Justice Department and American Airlines and needs only to get approval from the City of Dallas. And I think they will get such approval, too. Strangely, the City of Dallas has never treated Southwest Airlines with the deference you might expect. Furthermore, I have long thought that giving the gates to Southwest (legal or not) was probably a step too far in creating an airport monopoly for a single airline. Is Virgin America the right candidate? I kind of think not. I think that they are supported by the Justice Department because they favor LCC carriers and Virgin America purports to be that. I think they are supported by American Airlines because they are a weak(ish) competitor to American Airlines. Virgin America will only offer flights that are long haul and to major destinations such as San Francisco, Los Angeles and New York. They might get a few flights in to Chicago, a route so dominated by American Airlines that they have near hourly flights. American likely saw Virgin as having the least impact to them in the market. If that’s true, then it probably isn’t that good for consumers in the DFW area. Virgin America will be good for people who want to fly to Los Angeles, San Francisco, New York, Washington D.C. and Chicago. It’s notable that AA is the powerhouse on all of those routes while Southwest Airlines will be starting similar routes out of Love Field on October 13 of this year. But the frequencies will be low enough that it is unlikely to have impact on fares, I think. To the contrary, I think that this is great for Virgin America as they will experience high yields from these routes as a result of the other two airlines maintaining course. And this decision could drive me to write yet one more article on why we should auction off gates and slots at airports that are constrained. Competiton in the Dallas area? Probably not this year. There is the prospect of new found competition in the Dallas area when we see Southwest able to fly where it wants domestically starting October 13 of this year. The problem is, the more I think these developments through, the more I think that we won’t see much of that competition in 2014. Right now, Southwest is selling itself on convenience and doing well with that story. I think they will sell their new routes as convenience based options and I’m sure I’m not the only one to notice that their route announcements are focused on the business traveler. Repeat after me: Business travelers value convenience over price. Delta is also focused on the idea of serving Love Field by connecting to Delta’s hubs. Frankly, I don’t see that being a very good strategy because . . . do you want to fly to Atlanta to connect somewhere else or do you want to fly Southwest or American Airlines and just get there. Delta, I think, may well not even fly their intended routes. American Airlines is in an odd place as well. The airline must focus on integration intensively and can’t afford to pick a fight in Dallas right now. While they exited bankruptcy in pretty good shape, there are some fences to mend in Dallas over service. I think that 2014 and, possibly, 2015 will be spent on getting the airline’s act together. Airlines have figured out that fighting for marketshare is a losing proposition for everyone involved. Each CEO has made his mark (Gary Kelly, Richard Anderson and Doug Parker) by showing restraint. That trend should continue for some time. However, if Southwest is able to lure away the business traveler from the SuperLegacy airlines in the Dallas area on its new routes, I think all bets are off. That is a target market worth fighting for. But it will take time for Southwest to make its case to the traveler that it’s a worthwhile choice to fly from Dallas to Atlanta, New York, Baltimore, Chicago and elsewhere. You have to get a passenger to try the service and Southwest cannot afford to make a mis-step with those passengers. Service must be excellent and comfort must be of high value. It will take time to get travelers to try them out on the new routes and Southwest has to figure out how to do that while its local competitor (American Airlines) deploys fresh new aircraft and fixes it service issues at its home hub at DFW. Look for late 2015 to be the real moment of competition if there is any. It might come as a surprise that you really can’t sue an airline in a state court. For just about anything. Instead, you have to file your lawsuit in Federal court which means you have to have a basis of your lawsuit that is founded on Federal law. Since Federal law generally doesn’t address nuances (that’s generally left to states) and sets a high bar (because a lower bar is what States are for), lawsuits against airlines generally lose. Oh, it’s quite possible to do a personal injury suit against an airline in Federal court when there is a crash. But that has as much to do with the bad publicity as it does the law. You see, airlines managed to have most issues against them (for all practical purposes, all issues) moved to Federal court by an act of Congress back when Deregulation was occurring. This sets the bar very, very high for winning a lawsuit against an airline. It is a very protected place to sit as an industry. And unfair. You can sue Exxon wherever you want but you can’t sue American Airlines wherever you want. As a result, airlines are able to write egregious contract terms and abuse passengers on a daily basis with the clear knowledge that virtually all passengers can’t sue them. Imagine the change in attitude and service an airline might experience when it has to face a jury of its peers in East Texas after losing luggage, holding people hostage in an airplane and then arbitrarily cancelling their flight. I honestly struggle to find the justification for airlines to have such a protected status in 2014. Virtually all other service oriented industries manage to do just fine without such protections. We shouldn’t forget the purpose of a civil lawsuit: It’s to correct a wrong *and* take punitive action against an entity when it intentionally does that harm. By design, this is to give incentive to companies (and individuals) to Be Nice and Behave. Wouldn’t that be a near revolution in the airline industry? There is an opinion piece written by former Captain Les Abend on CNN’s website opining that the best explanation for what happened to MH370 is that there was a catastrophic event aboard the airliner that disabled all comms and then the pilots and that the plane simply flew itself until fuel exhaustion crashed the airliner. You can read this opinion HERE. 1) The airliner had a fire or similar event that disabled all radios and communications. An event disabling all 5 radios would almost have to involve the cockpit being removed from the airliner. We know this didn’t happen. Boeing has built redundancy into these aircraft but has also gone to fair trouble to ensure that a problem in one part of the plane doesn’t take out all of a system. Antennas are separated. Power sources are different. You really cannot lose all the radios simultaneously without something literally destroying the aircraft. Could they go out one by one? Yes. 2) He suggests that the callout of 35,000 feet is what pilots do to remind ATC to give them a higher clearance. Well, that’s true but what Mr. Abend neglects to mention is that 35,000 feet is a fairly high altitude and to go much higher so early in the flight wasn’t necessarily practical. To make the callout several times when already at a very high altitude and when there was no weather to clear, is suspect. 3) It’s suggested that a smoldering fire began to insidiously take out comms slowly, one by one. What this ignores is the fact that the electronics bay doesn’t just provide communications. It houses systems for the instrumentation of the entire aircraft. A “smoldering fire” would have been taking out other systems that would have caused alerts left and right. This aircraft is also a “fly by wire” system and those electronics reside, in part, in the electronics bay as well. Fires aren’t selective in what they impact. And electronics bays are heavily monitored for fire and smoke. 4) A degraded autopilot maintains course to the next waypoint and then remains in “heading mode” at high altitude. Pilots to do not stay at 35,000 feet in an emergency that they have to get an airplane onto the ground. To the contrary, they descend, work the checklists and start communicating their descent so that they don’t collide with other aircraft. Furthermore, the “nearest airport” wasn’t actually southwest and on the other side of the island. One with a really long runway was in that direction. Other commercial airports with sufficient runway length for landing existed. Navigation of the airliner is dependent on many systems that include the autopilot and instrumentation such as GPS and other nav aids. Absent these aids, that airliner will become lost. A smoldering fire that disables pilots, doesn’t continue to smolder without affecting the airframe for 6 to 7 more hours. I realize that its hard for commercial pilots to accept that a fellow pilot would do something nefarious. Yet. . . . we know that that has happened many times over the course of commercial aviation history. It happens. it’s ugly and it’s terrible. But it happens. I also realize that it’s nice to make pilots out to be heros who die in action. Yet, we also know that not every pilot is a hero. There are limits to every person. We don’t know what happened. And we won’t know what happened over the Gulf of Thailand ever. Not in the cockpit. The voice recorder doesn’t record that long. We will have some record of what was programmed, what the flight control inputs were and what was alarming and what wasn’t. It will tell a story but it won’t tell the whole story. It will tell the “what” but not the “why”. And only if we find the aircraft. But suggesting that this airliner was a ghost ship that crashed is foolish and fantastical does no one any good in looking at this event. Southwest Airlines has announced its intentions to start flying international routes for the first time in its history. Starting on July 1st, Atlanta, Baltimore and Orlando will have daily (or near daily) flights to Jamaica, Aruba and The Bahamas. For those of you paying attention, I think this could actually be construed as Southwest Airlines announcing its intention to keep Airtran destinations with a bit of Southwest flair. This makes sense because it fits within infrastructure that Southwest has today at those destinations. Southwest can “learn” how to be an international carrier and ensure its new reservations system which is debuting in international form with these additions. Consider this: Southwest has been trying to have some form of international flight via partners or itself since 2008. It’s 2014 now. Wow, that took a long time. These are the first announcements, I expect many more international announcements this year and next. I think Southwest will seek to cover the Airtran destinations it wants to keep first and then will start exploring flights to new destinations both across the Gulf of Mexico and Caribbean Sea as well as to Mexico and Canada. What this most defnitely is not is a move to a need for a different aircraft. Southwest’s current fleet plans can handle these flights just fine. It’s possible that additional foreign destinations may drive more 737-800/-8Max purchases but we expected that anyway. According to the Dallas Morning News, Delta Airlines has released a schedule that now includes October 2014 and apparently Delta expects to fly a massive number of flights from Love Field to its own hubs. By massive, it would appear that Delta has 22 flights to its hubs in Atlanta, Detroit, Minneapolis/St. Paul, New York La Guardia and Los Angeles. The only two cities missing are Salt Lake City and Seattle. Delta wants to use the American Airlines gates at Love Field that it rents today for those flights. 22 flights from 2 gates seems a touch optimistic so I do wonder if Delta has something else up its sleeve. Southwest has 16 gates and no one is entirely sure if they can have more than that. American Airlines has 2 gates and United has 2 gates. According to restrictions put in place in winding down the Wright Amendment, no more gates are supposed to be built. The real shame of that is that there are several gates across the tarmac from the main terminal originally built for Legend Airlines that would be exceptional for use in a Delta operation. The City of Dallas and the airport authorities don’t want to allow expansion at Love Field. They want traffic to be focused on DFW airport but . . . DFW airport is actually pretty full at this point. There will be a few gates at DFW available for use once Terminal E is renovated but not many and they’ll go quickly. So why not open up Love Field even more? I wonder if Delta isn’t planning to sue for more access myself. In the meantime, let’s ponder for a minute the chance to fly Delta to its hubs from Love Field airport in less than a year. That’s what I meant by Change, It’s coming. American Airlines has announced that it is adding two new routes from DFW to Hong Kong and Shanghai and has done so with great fanfare. The Shanghai route will use American’s 777-200ER but the Hong Kong route will make use of AA’s newest 777, the 777-300ER. I’m a fervent believer that international routes will trend towards longer, thinner routes. I do not believe that either the 747 or the A380 has a very strong place in the airline world today. But I also think that the 777 fits neatly into that high capacity, long route structure that so many airlines are using to make big money from. And American is clearly doing very, very well using the -300ER. So well that one does wonder at the reticence to purchase being shown by both United and Delta. Yes, each still has the 747-400 and I would argue that neither is well served by that aircraft. Particularly in light of the age and the changing structure of routes. So let’s celebrate something that you hear very rarely from me: Congratulations to American Airlines for a very wise decision. Someone has sued United Airlines for having an algorithm in its frequent flier system that causes more points to be charged to those who have more points when redeeming frequent flier points for hotels. United Airlines says this suit is without merit. Curiously, I have often noticed that American Airlines own system often will offer me a “low” price in points for a flight that if I do not take it, minutes later “disappears” and is replaced with a higher price. And keeps incrementing as long as I stay on the site. Mind you, this is an anecdotal observation and I really have no idea of what strategy is employed by airlines with their points based system. But such strategies have an “airline smell” about them. And that’s why I think frequent flier points are useless and not be sought when choosing travel. In an unrelated story about United Airlines in the New York City area, some interesting statistics were noted by the Dallas Morning News. If we combined American Airlines, US Airways and Southwest in the NYC marketplace, we would have an airline with just 19.5% share of the market. Still less than Delta and still considerably less than United. And be mindful of the fact that SWA isn’t even considered a player in the NYC market as they’ve been unable to obtain gates or additional landing slots at the airports. Care to guess who comes after Southwest? That would be British Airways and Air Canada. Yes, two foreign carriers are next in line with shares of 1.4% and 1.2% respectively. On the tail end are Spirit and Virgin America with about 1% of the market each. So when we talk about how there is an imbalance in the marketplace, let’s be mindful of the fact that the top two largest airlines (United and Delta) combine to own nearly 50% of one of the most competitive markets in the world. And if you combined both AA and US Airways, they would still be at a significant disadvantage with just 16.7% of the NYC market. I don’t disagree that the combination’s dominance in Washington D.C. should require divestiture of slots by those two airlines. But the economic pricing power that the two SuperLegacy airlines have today are so great that they will gain more share over time rather than less with the current market conditions. More of that market share means even more pricing power which means even greater increases in air fares. But, hey, far be it for me to introduce rational thought in the US Airways / AA merger argument. A while back Alaska Airlines decided to use its subsidiary Horizon Air to provide most of the service between its Anchorage hub and Fairbanks Alaska. I wrote about this decision when it was made and notice that they are preparing to introduce this change in the near future. The Q400 was insulted by Fairbanks, to be honest. It was regarded as a big insult to the city of Fairbanks who failed to recognize that those 30% savings were needed on routes between the two cities. Let’s be clear: air fares between these two cities are highly competitive yielding as little as about $130 per seat. A Q400 makes it possible for Alaska Airlines to better serve the route. 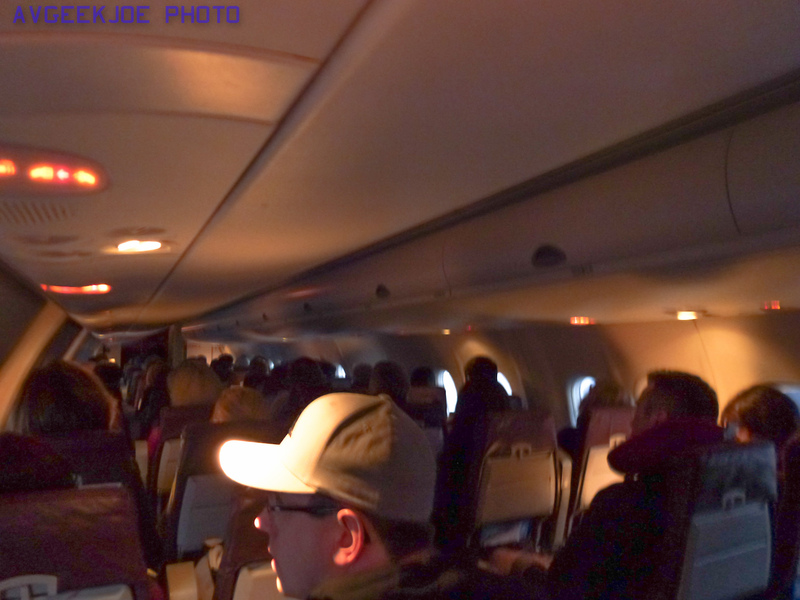 As they are introducing the aircraft to the city, I thought it might be interesting to offer a few links to photographs of the cabin of the aircraft just so people could see just what citizens of Alaska are getting. One other item of note: Alaska Airlines / Horizon Air’s biggest competition on this route comes from Era Alaska. Era Alaska uses the Q400′s father, the Dash-8-100 on that same route.